A friend or family member has experienced Sudden Infant Death Syndrome (SIDS). You want to help, but are not sure how to. This article will guide you in ways to turn your cares and concerns into actions. A vital part of helping SIDS survivors is to learn about the syndrome. The term itself can be difficult to comprehend. Why? It is really a non-definition. This clinical-sounding term doesn’t describe what doctors know, but, instead, what they don’t know. For example, a formal definition of SIDS is: the sudden death of any infant which is unexpected through medical history, and in which a detailed exam after death fails to find an adequate cause for the demise. Essentially, no one knows what causes these deaths. What we do know is that each year in the United States over 7,000 families experience death of their babies to SIDS. These sudden deaths occur in apparently healthy infants, almost always while the child is asleep. This experience creates an overwhelming crisis for parents, brothers and sisters, grandparents, other family members and friends. SIDS and apnea (cessation of breathing) are two different things. Do not assume that if the baby had been on a breathing monitor, she would not have passed away. Remember–SIDS cannot be predicted or prevented. Grief following a SIDS death is always complex. The infant has passed away at a time when the family is very focused on caring for him / her. The lack of knowledge about SIDS often adds to the trauma. All too often a SIDS death is not socially supported in the way other deaths are. Some people fail to realize that despite the shortness of the infant’s life, the family’s feelings of love for him have existed since conception. Survivors are confronted with mourning not only the immediate demise, but also the loss of hopes and dreams for the child’s future. Don’t be surprised by the intensity of their feelings. Sometimes when family members least suspect it, they may be overwhelmed by grief. Accept that survivors may be struggling with feelings of guilt, anger and fear well beyond those experienced after other types of deaths. Be patient, compassionate and understanding. Helping begins with your ability to be an active listener. Your physical presence and desire to listen without judgment are crucial helping tools. Willingness to listen is the best way to offer help to someone who needs to talk. The SIDS survivor’s thoughts and feelings may be frightening and difficult for you to acknowledge. Don’t worry so much about to say. Concentrate on the words being shared by the grieving family. Do use the baby’s name when you talk about the demise. For survivors, hearing the name can be comforting, and it helps confirm that the baby was not just a baby, but an important person in their life. Your friend or family member may tell the same story about the death over and over again. Listen attentively every time. Realize that repetition is part of the healing process. Simply listen and understand. Remember, you don’t have to have the answer. Clichés, though they are often intended to diminish the pain of loss, can be extremely painful for survivors of Sudden Infant Death Syndrome. Comments like, “You can have another baby,” “They passed away young and avoided life’s hurts” and “Think of what you still have to be thankful for” are not constructive. Instead, they hurt and make a friend’s journey through grief more difficult. Instead of simplistic explanations, familiarize yourself with the wide spectrum of emotions your friend or family member may experience. Allow the person to experience all the hurt, sorrow and pain that he or she is feeling at the time. Recognize that tears are a natural and appropriate expression of the pain associated with the demise of the infant. Often ignored is the grief of siblings. Why? Adults have an instinct to protect children from painful realities. Yet any child old enough to love is old enough to mourn. When a child’s brother or sister passes, another young person has died. So, for a child, confronting this reality can mean confronting the possibility of one’s own death. Be prepared to honestly but reassuringly answer questions such as, “Will I die, too?” Don’t expect young people to acknowledge the reality of death in the same way adults do. Many children naturally embrace the reality slowly and may at times seem indifferent. Typically, the full sense of loss does not come about until several months after the death. Preparing food, washing clothes, cleaning the house or answering the telephone are just a few practical ways to show you care. Your presence is needed by the family this support is helpful at the time of the demise and in the weeks and months ahead. Your presence at the funeral is important. 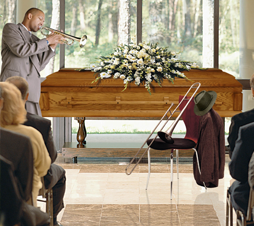 As a ritual, the funeral provides an opportunity for you to express your love and concern. At the funeral, a touch of your hand, a look in your eye or even a hug often communicates more than any words could ever say. Don’t just attend the funeral and disappear. Be sure to remain available afterwards as well. Remember, your grieving friend or family member may need you more in the days or weeks after the funeral than at the time of the demise. A brief visit or call in the days that follow are usually appreciated. Remember that the demise of a child to SIDS is a shattering experience. As a result of this death, your friend’s life is under re-construction. Be gentle and compassionate in all of your helping efforts.